In Brazil – “Valentine’s Day”- Dia dos Namorados – actually occurs on June 12. February 14 is too close to Carnaval – which dominates the festivities for a month in Brazil – so putting the holiday in June makes a lot of sense. Dia dos Namorados is celebrated in similar way by showering your sweetheart with chocolates, cards, flowers and the like. This year we made brigadeiros to celebrate, however there are a wealth of other Brazilian treats appropriate for the day, some even with romantic names: beijinhos (little kisses), casadinhos (little marrieds) and bem casados (well-marrieds). 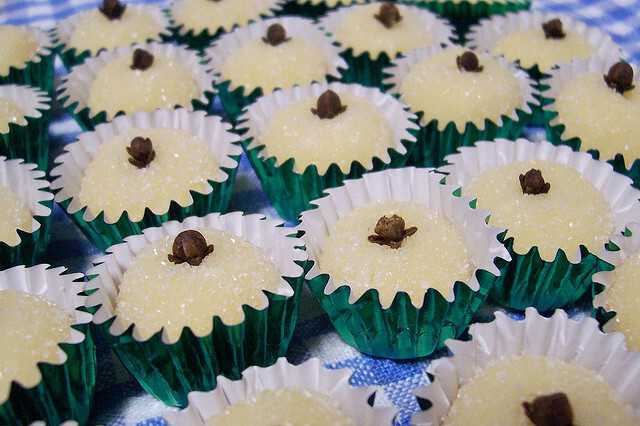 Beijinhos are little coconut candies, “kissed” with cloves, hence the name. They are almost like a coconut version of brigadeiros, and are nearly as popular in Brazil. The recipe for making them is almost identical to a brigadeiro recipe (minus the chocolate), whether covered in sugar or coconut flakes. Casadinhos are black and white brigadeiros (“marrying” the two flavors) – unfortunately I can’t find a recipe for these in English, but here is one in Portuguese. Bem casados are sandwich cookies with a doce de leite filling, which are understandably popular at weddings on the dessert table or as favors. Here is a recipe from Kitchen Corners that even includes homemade doce de leite, and another from the Cookie Shop blog with frosting. Feliz Dia dos Namorados! Nice to learn about a treat day! All of these look and sound good. Cute names too! Saving the recipes.